↑ "Voyager 1". NSSDC Master Catalog. NASA/NSSDC. Archived from the original on December 14, 2013. สืบค้นเมื่อ August 21, 2013. ↑ "Voyager 1". N2YO. สืบค้นเมื่อ August 21, 2013. ↑ "Voyager - Mission Status". Jet Propulsion Laboratory. National Aeronautics and Space Administration. สืบค้นเมื่อ January 1, 2019. ↑ "Voyager 1". BBC Solar System. Archived from the original on February 3, 2018. สืบค้นเมื่อ September 4, 2018. ↑ "Voyager – Frequently Asked Questions". NASA. February 14, 1990. สืบค้นเมื่อ August 4, 2017. ↑ "New Horizons conducts flyby of Pluto in historic Kuiper Belt encounter". สืบค้นเมื่อ September 2, 2015. ↑ "What If Voyager Had Explored Pluto?". สืบค้นเมื่อ September 2, 2015. ↑ Barnes, Brooks (September 12, 2013). "In a Breathtaking First, NASA Craft Exits the Solar System". New York Times. สืบค้นเมื่อ September 12, 2013. ↑ Wall, Mike (December 1, 2017). "Voyager 1 Just Fired Up its Backup Thrusters for the 1st Time in 37 Years". Space.com. สืบค้นเมื่อ December 3, 2017. ↑ "1960s". JPL. Archived from the original on December 8, 2012. สืบค้นเมื่อ August 18, 2013. ↑ "The Pioneer missions". NASA. 2007. สืบค้นเมื่อ August 19, 2013. ↑ Mack, Pamela (1998). "Chapter 11". From engineering science to big science: The NACA and NASA Collier Trophy research project winners. History Office. p. 251. ISBN 978-0-16-049640-0. ↑ Landau, Elizabeth (October 2, 2013). "Voyager 1 becomes first human-made object to leave solar system". CNN. CNN. สืบค้นเมื่อ May 29, 2014. ↑ "NASA Spacecraft Embarks on Historic Journey into Interstellar Space". NASA. September 12, 2013. สืบค้นเมื่อ May 29, 2014. NASA's Voyager 1 spacecraft officially is the first human-made object to venture into interstellar space. ↑ "Viking: Trailblazer for All Mars Research". NASA. June 22, 2006. สืบค้นเมื่อ May 29, 2014. All of these missions relied on Viking technologies. As it did for the Viking program team in 1976, Mars continues to hold a special fascination. Thanks to the dedication of men and women working at NASA centers across the country, the mysterious Mars of our past is becoming a much more familiar place. ↑ "VOYAGER 1:Host Information". JPL. 1989. สืบค้นเมื่อ April 29, 2015. ↑ "High Gain Antenna". JPL. สืบค้นเมื่อ August 18, 2013. ↑ Ludwig, Roger; Taylor, Jim (March 2002). 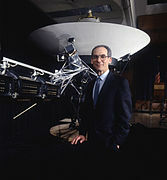 "Voyager Telecommunications" (PDF). DESCANSO Design and Performance Summary Series. NASA/JPL. สืบค้นเมื่อ September 16, 2013. ↑ "NASA News Press Kit 77–136". JPL/NASA. สืบค้นเมื่อ December 15, 2014. ↑ Furlong, Richard R.; Wahlquist, Earl J. (1999). 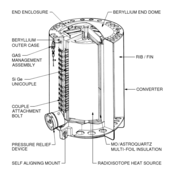 "U.S. space missions using radioisotope power systems" (PDF). Nuclear News. 42 (4): 26–34. ↑ "Spacecraft Lifetime". JPL. สืบค้นเมื่อ August 19, 2013. ↑ "pds-rings". สืบค้นเมื่อ May 23, 2015. ↑ Tomayko, James (April 1987). "Computers in Spaceflight: The NASA Experience". NASA. สืบค้นเมื่อ February 6, 2010. ↑ "au.af". สืบค้นเมื่อ May 23, 2015. ↑ "airandspace". สืบค้นเมื่อ May 23, 2015. 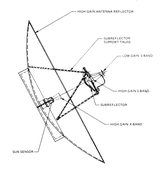 ↑ "Voyager 1 Narrow Angle Camera Description". NASA. สืบค้นเมื่อ January 17, 2011. ↑ "Voyager 1 Wide Angle Camera Description". NASA. สืบค้นเมื่อ January 17, 2011. ↑ Greicius, Tony (2017-12-01). 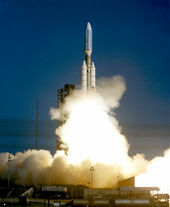 "Voyager 1 Fires Up Thrusters After 37 Years". NASA (in อังกฤษ). สืบค้นเมื่อ 2017-12-13. ↑ "Encounter with Jupiter". NASA. สืบค้นเมื่อ August 18, 2013. ↑ "Planetary voyage". NASA. สืบค้นเมื่อ August 18, 2013. 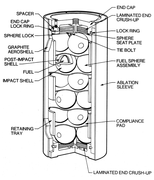 ↑ "Catalog Page for PIA17046". Photo Journal. NASA. สืบค้นเมื่อ April 27, 2014. ↑ "It's Official: Voyager 1 Is Now In Interstellar Space". UniverseToday. สืบค้นเมื่อ April 27, 2014. ↑ "Future". NASA. สืบค้นเมื่อ October 13, 2013. Voyager Spacecraft Lifetime — interstellar mission coverage.